Tar spot is a foliar disease of corn that commonly occurs throughout Mexico, Central America, South America, and the Caribbean. The disease was identified in the United States for the first time in 2015 in northern Illinois and Indiana. As of 2018, it has been confirmed in Iowa, Michigan, Wisconsin, Ohio, and Florida. During the 2018 growing season, the prevalence and severity of the disease increased dramatically, and in some areas tar spot caused substantial yield losses. In the United States, tar spot of corn is caused by the fungus Phyllachora maydis. The fungus produces small (0.2-0.8 inch), round to semi-circular, raised black structures called stromata. In severe cases, stromata may also be observed on leaf sheaths and husks. Tar spot severity on ear leaves at growth stage R5 (dent stage) can exceed 50 percent in susceptible hybrids when conditions are favorable for the disease. Corn at any developmental stage is susceptible to infec­tion by the tar spot fungus when conditions are favor­able. 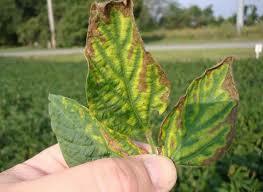 Disease symptoms have been observed as early as the third-leaf (V3) growth stage in the United States. P. maydis overwinters on infested corn residue on the soil surface, which serves as a source of inoculum for the subsequent growing season. It is not known if P. maydis overwinters on or infects any other plant hosts in the United States. Conditions that Favor Disease In Latin America, cool temperatures (60-70°F) and high relative humidity (greater than 75 percent) favor tar spot development. In addition, disease incidence increases when there is at least seven hours of free moisture on the leaves due to rain, fog, or high relative humidity. However, it is not currently known what conditions favor the disease in the United States. In both 2015 and 2018, warm weather and periods of persistent rain and high humidity during the growing season likely favored the development and spread of the disease. Continuous corn cultivation with minimum tillage practices, and high application rates of nitrogen fertilizer are also positively correlated with increased disease in Latin America. Although corn lines have been identi­fied in Latin America that have resistance to tar spot complex, U.S. observations indicate that most hybrids grown in the North Central region are susceptible to P. maydis (although they differ in susceptibility). 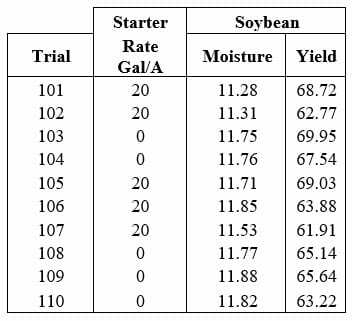 Yield Losses and Impact Preliminary data from the Midwest indicate that severe tar spot outbreaks can reduce yield by more than 30 bushels per acre. Yield losses are a function of reduced ear weight, poor kernel fill, loose kernels, and vivipary (a condition in which the seed germinates while still on the cob). Observations also suggest that stalk rot and lodging are increased when tar spot severity is high. Severe tar spot also reduces forage quality. Diagnosis You can diagnose corn tar spot in the field by examining corn leaves for the presence of black, tar-like spots. 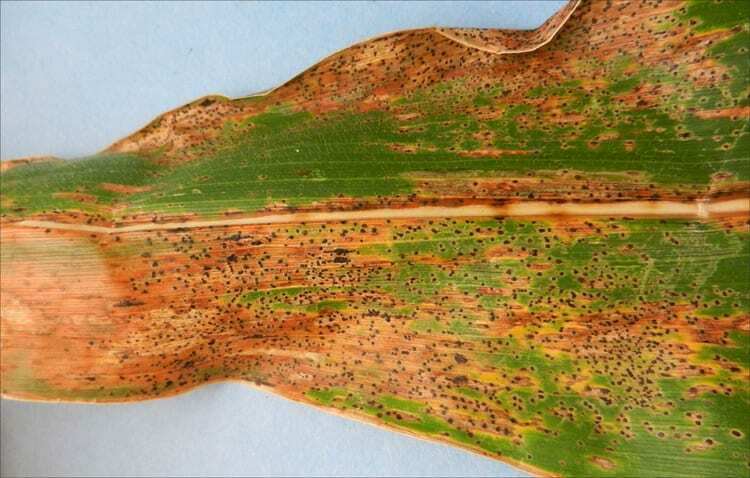 To date, tar spot has been observed most often during mid-to late grain fill (growth stages R3-R6) and usually on leaves below or near the ear leaf. You can observe stromata in green and senesced tissues. Occasionally, you may also observe necrotic brown tissue surrounding the black structures, which produces a fisheye appear­ance. Management Most of what we know about tar spot has originated from Mexico and Central America. 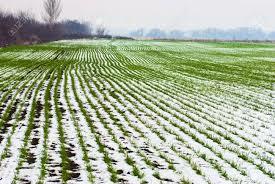 However, differences in the environments, fungal populations, hybrid genetics, and cropping systems may influence disease development in different areas. Our understanding of this disease in the United States is limited because of its very recent history. However, several management practices may help reduce tar spot development and severity. 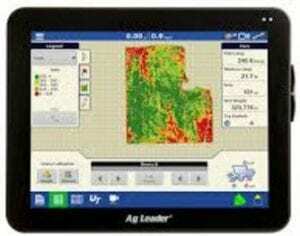 Manage residue. 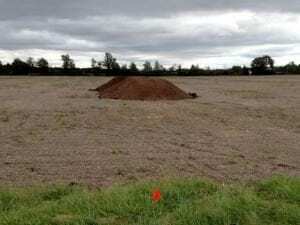 Tilling fields buries infected residue and encourages it to decompose, which may help reduce the amount of overwintering tar spot inoculum. Rotate to other crops. This will allow residue to decompose and reduce the primary It is not yet known how many years it may take to sufficiently reduce inoculum. 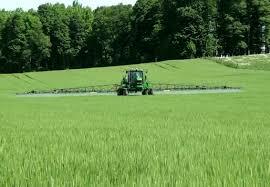 Investigate fungicides. 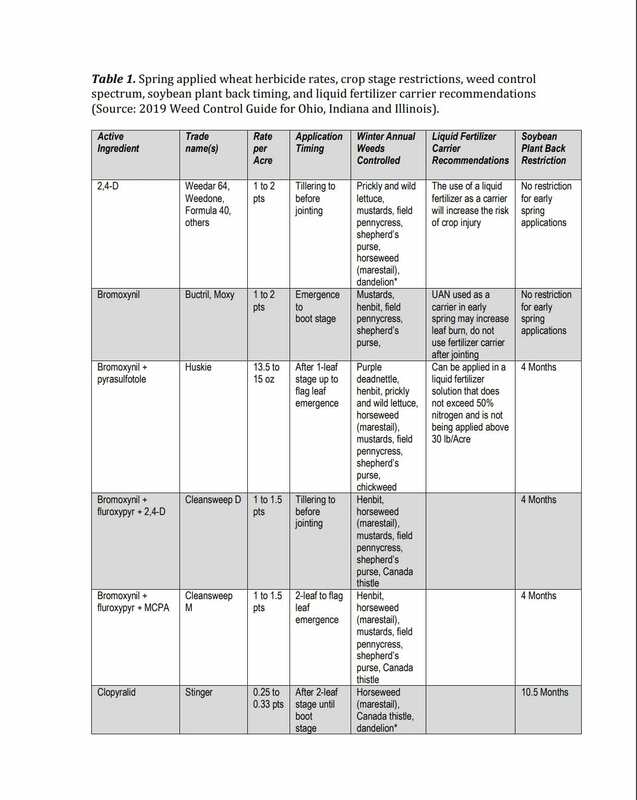 Some fungicides may reduce tar spot, however, we have little data about application timing that will provide an effective and economical response. 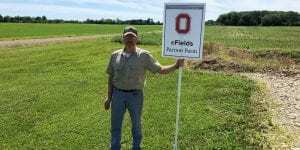 Efforts are underway to understand the biology and epidemiology of this disease, which may help formulate fungicide application decisions in the future. A BIG thank you to David & Emily Mitchem for allowing me to put my Soybean Starter Fertilizer trial on their farm this year! Poor stalk quality is being observed and reported in Ohio corn fields. One of the primary causes of this problem is stalk rot. 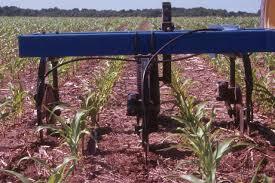 Corn stalk rot, and consequently, lodging, are the results of several different but interrelated factors. The actual disease, stalk rot, is caused by one or more of several fungi capable of colonizing and disintegrating of the inner tissues of the stalk. The most common members of the stalk rot complex are Gibberella zeae, Colletotrichum graminicola, Stenocarpella maydis and members of the genus Fusarium. The extent to which these fungi infect and cause stalk rot depends on the health of the plant. In general, severely stressed plants (due to foliar diseases, insects, or weather) are more greatly affected by stalk rot than stress-free plants. The stalk rot fungi typically survive in corn residue on the soil surface and invade the base of the corn stalk either directly or through wounds made by corn borers, hail, or mechanical injury. Occasionally, fungal invasion occurs at nodes above ground or behind the leaf sheath. The plant tissue is usually resistant to fungal colonization up to silking, after which the fungus spreads from the roots to the stalks. When diseased stalks are split, the pith is usually discolored and shows signs of disintegration. As the pith disintegrates, it separates from the rind and the stalk becomes a hollow tube-like structure. Destruction of the internal stalk tissue by fungi predisposes the plant to lodging. Nothing can be done about stalk rots at this stage; however, growers can minimize yield and quality losses associated with lodging by harvesting fields with stalk rot problems as early as possible. Scout fields early for visual symptoms of stalk rot and use the “squeeze test” to assess the potential for lodging. Since stalk rots affect stalk integrity, one or more of the inner nodes can easily be compressed when the stalk is squeezed between the thumb and the forefinger. The “push” test is another way to predict lodging. Push the stalks at the ear level, 6 to 8 inches from the vertical. If the stalk breaks between the ear and the lowest node, stalk rot is usually present. 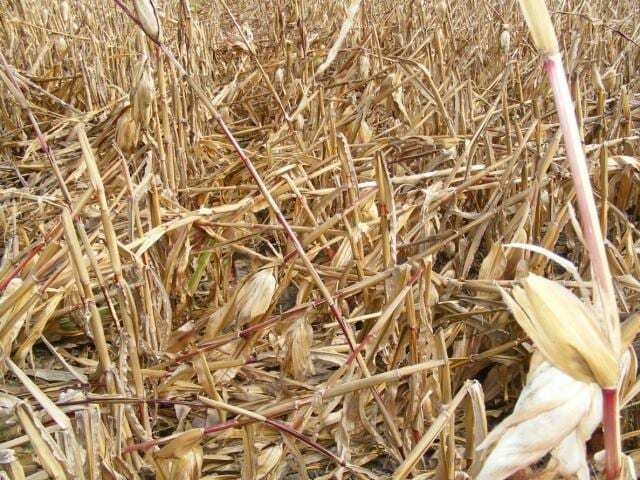 To minimize stalk rot damage, harvest promptly after physiological maturity. 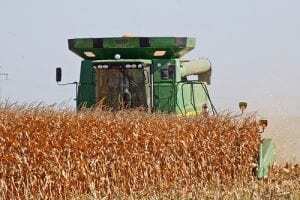 Harvest delays will increase the risk of stalk lodging and grain yield losses and slowdown the harvest operation. 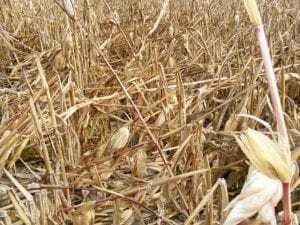 Since the level of stalk rot varies from field to field and hybrids vary in their stalk strength and susceptibility to stalk rot, each field should be scouted separately. 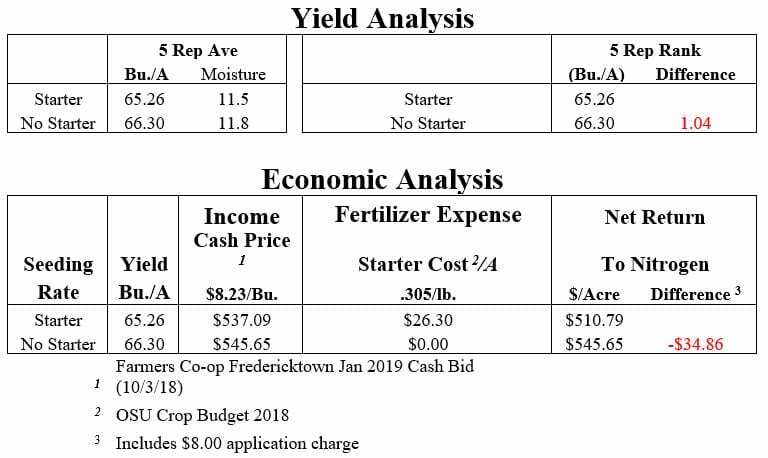 NutrientStar, an independent evaluator of nutrient management tools, has just released results testing the performance of two web-based tools that provide customized corn nitrogen fertilizer rates: Adapt-N and Climate FieldView. Both tools are available for farmers in Ohio to use for a fee. NutrientStar conducted 61 trials over 3 years evaluating Adapt-N and 21 trials over 2 years evaluating FieldView in Ohio. A summary of findings is presented below. 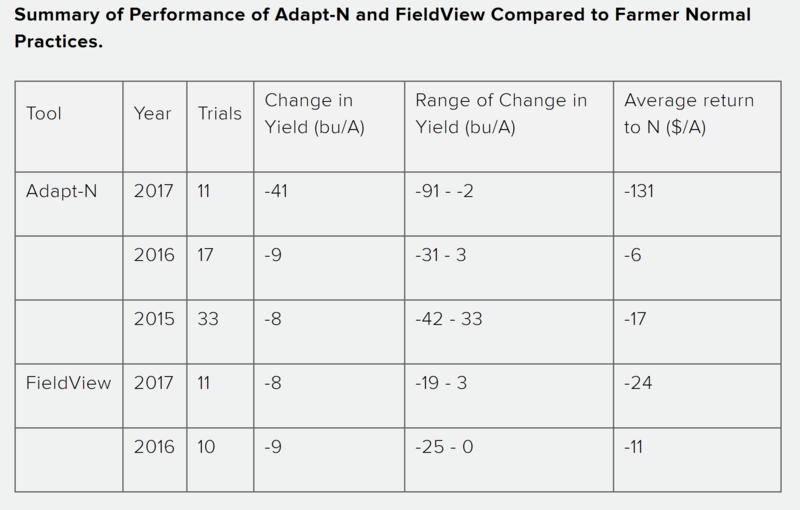 Compared to ‘farmer normal practice’ using the tools produced a range of yield differences across trials and years in Ohio. Some trials yielded more grain using the tools (positive values) and some yielded less grain (negative values). When all trials within a year were averaged, both tools resulted in lower yields compared to farmer normal practices (8 – 41 bushels/acre less). Depending on the year, farmers lost on average between $6 – $131/ acre on their return to N fertilizer. 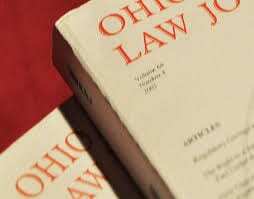 The results varied by state, with some states benefiting from the tools and other states not benefiting from the use of the tools. Unfortunately, these tools have not performed well in Ohio to date. Soybeans across the state range from ready to harvest to still flowering. 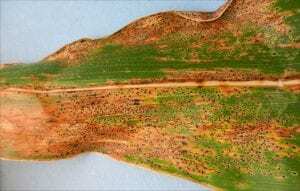 But in some fields, the yellowing was limited to pockets – some was sudden death syndrome or brown stem rot, charcoal rot, Phytophthora stem rot, and soybean cyst nematode. There are some other early yellowing situations that we are still working on an accurate diagnosis, but yellowing in these cases may be linked to fertility issues and/or related to late flooding injury. 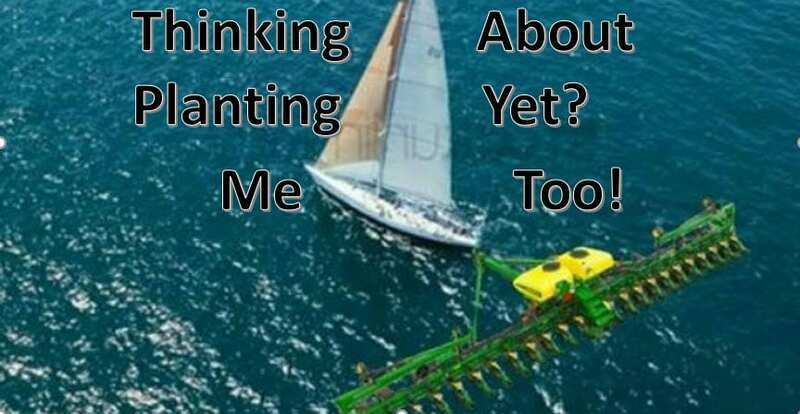 I think in 2018 we’ve observed just about everything, and it was all dependent on where in the state the soybeans were grown, how much rain occurred and when that rain fell, as well as the variety. It did seem that we had calls on the same variety from multiple regions. The heat this past weekend is also going to move the crop fairly fast. So if you haven’t driven by the earliest planted fields – this is the week to do so. Sudden death syndrome is very widespread – but in most fields, it is limited to a scattering of plants throughout the wet areas. The plants were not severely affected as most of the fields I visited were holding their leaves and not defoliating as quickly as I have observed for the most susceptible varieties. Late season Phytophthora stem rot is also present – in this disease, the plant wilts, holds its leaves and develops a brown canker that extends from the base of the plant up the stem. Charcoal rot can also cause early yellowing or dying, and these symptoms were present last week in several areas of the state. To distinguish this from other diseases, cut open the tap root and look for the black dots embedded in the tissue and lower stem. When populations of soybean cyst nematode are high, plants will also mature earlier. For cyst, you can dig up the plants, shake the soil off and see the small white pearls (females) on the roots. Often we need a microscope as the cyst will turn tan to brown and becomes hard to see. This round of late season scouting is important for variety selection, improving fertility applications for the fall, and prioritizing which fields to sample for soybean cyst nematode. Let’s just hope the weather cools so we can get out of the trucks and walk into the fields!